Bamboozled January 29, 2018: A $535 shipping fee to return a wrong order? Free shipping has been the trend for online and catalog orders. It’s often expected by consumers who will gladly shop elsewhere to get the benefit. Free returns aren’t as common, but as more retailers try to get customers to buy, more are happy to pay for your returns. John Spears said he thought he was getting a free return. Instead, he was gut-punched with a $535.43 shipping fee. Spears is an artist, and he often orders large containers of supplies. In September, he ordered a five-gallon jug of ink, but the supplier – Bolger & O’Hearn of Fall River, Mass. – mistakenly sent the wrong color. “The supplier said no problem, and they would exchange at no cost or charge for its return,” Spears said. That was important because the container weighed 40 pounds. A redacted copy of the “bill of lading” received by John Spears to authorize the return. Spears received written authorization for the free return. When he saw a local UPS truck later in the day, Spears said, he asked the driver to take the shipment. The driver said Spears would need to call UPS to make the arrangement. 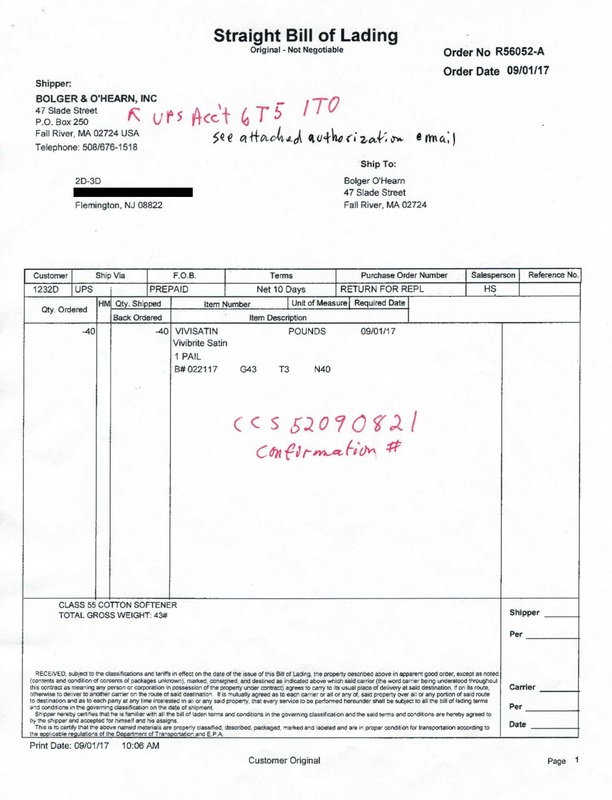 So Spears called, saying he had a “bill of lading” — which was at the top of the return paperwork from the supplier. The UPS representative said Spears needed to speak to a different division: UPS Freight. He was transferred, and he was given information about the pick-up. Then it got strange, he said. “I received a call from a UPS truck driver who was driving an 18-wheeler truck who asked me to bring the return item to him since it was obvious he could not drive his 18-wheeler truck down my driveway,” Spears said. Spears lugged the container down the driveway to meet the driver, who labeled the pail with multiple bar code stickers. The driver used Spears’ cell phone to take photos of the bill of lading with the bar code labels so Spears could use that as a receipt, and Spears had written the supplier’s account number on the paperwork so it would be clear who should be billed. An hour later, the regular UPS driver showed up to get the already-gone container. Spears immediately called the number on the UPS Freight invoice. He said he was told the phrase “bill of lading” implies freight and that’s why he was sent there when he called for the pick-up. “Never was it explained to me when I called the first time that my pick-up request would be freight bound,” Spears said. UPS wouldn’t budge on the price. So he called his supplier, who also refused to pay the large bill. It said it would have gladly paid the $32.93 it was supposed to cost if shipped by regular UPS. John Spears, an artist from Kingwood Township, received a 5-gallon container of paint from a supplier, but it was the wrong color. The supplier was going to cover $32.93 for the return shipping, but somehow UPS sent its freight service to pick it up, and it charged Spears $535 for the shipping. He negotiated it down to $160, but believes UPS should be responsible. Spears would have to take his complaint to UPS Freight. Plus, he said, the transaction created an account in his name that he never authorized. UPS Freight didn’t take responsibility for the error, but it agreed reduce the bill to $160. That still cost more than the container of paint, Spears said. Even though he disagreed, Spears said, he just paid the bill rather than risk a bad mark on his credit history. Spears is convinced he’s in the right, saying UPS should have asked him about the item he was shipping before transferring him to the freight division. And, he said, UPS should have seen that he wrote the supplier’s account number on the bill of lading. “Their system is broken,” he said. We reviewed all the paperwork and asked UPS to take a closer look. We also asked how an account was created in Spears’ name without his permission. UPS examined the case, and said the supplier who sent the ink made a mistake. Bolger & O’Hearn has an account with the UPS’ parcel service — the service most people use — and it also has a UPS Freight account. John Spears holds a five-gallon container of paint in his studio. He’s fighting UPS over what he said was an overcharge on a fee to return a wrong order from his supplier. He said Spears was listed as the shipper, and that’s why UPS Freight created an account for him — something done regularly for tracking purposes when the shipper doesn’t already have an account. UPS said it contacted the vendor about its error, but the vendor still didn’t want to pay the higher price. UPS didn’t want Spears to have to pay given that it wasn’t his error, so it agreed to lower the price to what would have been paid using the small package service — $32.93. Spears will be get a refund of $127.07. We appreciate UPS helping Spears, but we wanted to know what the supplier — Bolger & O’Hearn — had to say about the dispute. The company’s purchasing manager, Sonja Backstrom, said she doesn’t know how UPS Freight got involved, other than to guess it was because Spears mentioned a bill of lading, which is used by carriers for larger freight amounts. She said Bolger & O’Hearn is will reimburse Spears for the $32.93 freight charge. We’re grateful to Bolger, and to UPS, for making this right for the customer. Spears said he is happy with the resolution, and he hopes others will learn from his experience.